The citrus gall midge, Prodiplosis longifila, Gagné was first found in Florida by Rainwater (1934). This gall midge was collected on lime trees, Citrus aurantifolia (Christm.) Swingle, at Homestead, Dade Co., Florida during the fall of 1984 by the senior author. The adult was described in 1986 by R.J. Gagné. Figure 1. 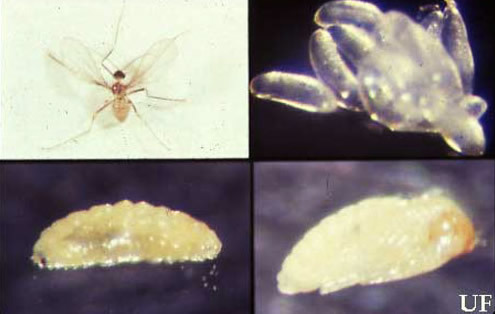 Adult (upper left), eggs (upper right), larva (lower left), pupa (lower right) of the citrus gall midge Prodiplosis longifila Gagné. Photograph by Rita Duncan, University of Florida. Gagné (1986) reported P. longifila from Florida, South America, and the West Indies. The adult midge is a small, black-yellowish fly about 1.5 mm in length. The wing lengths average 1.42 mm in males and 1.53 mm in females. The antenna lengths average 1.62 mm in males and 1.22 mm in females. The eggs are small, clear, about 0.27 mm in length. The larva is almost transparent when newly formed and yellowish during the last instar. A full grown larva is about 1.9 mm in length. The pupa is light yellowish when newly formed and black and yellowish near adult emergence. Eggs hatch in one to two days. Larval development requires eight to 12 days. The larvae drop to the ground where the pupal stage is passed. The pupal stage lasts four to five days, and adults typically live one to two days. Gagné (1986) has provided a key to adults of Nearctic species of Prodiplosis. This insect is known from limes, Citrus aurantifolia; tomatoes, Lycopersicon esculentum; potatoes, Solanum tuberosum, and wild cotton, Gossypium sp., etc. The larva of P. longifila is a pest of limes (Pena et al. 1987). In 1984, heavy infestations were encountered attacking lime groves in Dade and Collier counties. Larvae feed on flowers, damaging the epidermal cells of the ovary, pistils, and stamens. The mean number of larvae found per flower was 24.26. Look for flowers with necrosed ovary, stamens, and petals. Where infestations are heavy there may be excessive flower drop. Control information is very limited for this pest. However, biological control has provien to be very effective (Peña et al. 1990). If control appears to be necessary contact your local county Cooperative Extension Service agent. Gagné RJ. 1986. Revision of Prodiplosis (Diptera: Cecidomyiidae) with description of three new species. Annals of the Entomological Society of America 79: 235-245. Peña JE, Baranowski RM, McMillan Jr RT. 1987. Prodiplosis longifilia (Diptera:Cecidomyiidae), a new pest of citrus in Florida. Florida Entomologist 70: 527-529. Peña JE, Gagné R, Duncan R. 1989. Biology and Characterization of Prodiplosis longifila (Diptera: Cecidomyiidae) on Lime in Florida. Florida Entomologist 72: 444-450. Peña JE, Duncan R, Torres V. 1990. Control of the citrus midge Prodiplosis longifila Gagné in southern Florida limes. Proceedings of the Interamerican Society for Tropical Horticulture 1990: 159-161. Rainwater CF. 1934. Insects and a mite of potential economic importance found in wild cotton in Florida. Journal of Economic Entomology 27: 756-7 61. Authors: J. E. Peña, University of Florida; and F.W. Mead, Florida Department of Agriculture and Consumer Services, Division of Plant Industry. Originally published as DPI Entomology Circular 312. Updated for this publication. Publication Date: July 1998. Latest revision: May 2011.